DynoTune Product, 109.1-Billet Aluminum Bottle Brackets 10/15LB bottles - DynoTune, Nitrous systems, Purge kits, Nitrous Bottle heaters and more! This Nitrous Bottle Bracket is CNC Machined from 6061-T6 aircraft grade Billet aluminum then chrome plated for that show look. This is for standard 10/15LB bottles. It has machined radius edges all the way around for that clean look and feel with a fine brushed finish, and uses Stainless Steel bolts. 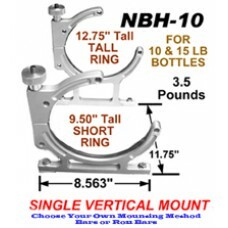 This Bracket has been designed for fast and easy dismount and remount when filling is needed, just unscrew the 2 knobs,NO TOOLS NEEDED!